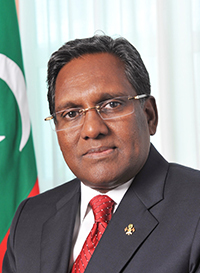 Dr. Mohamed Waheed was elected Vice President of Maldives on 28 October 2008. He is the first elected Vice President of the Maldives. Dr. Waheed is Leader of the Gaumee Itthihaad party which formed alliance with the Maldives Democratic Party (MDP) in September. Dr. Waheed’s political career began in 1998 when he ran the first Western-style election campaign and won the parliamentary seat for the largest constituency in the country. Dr. Waheed is an experienced international civil servant who has worked in headquarters, regional and country offices of the United Nations. Until July 2008, he was UNICEF Country Representative in Turkmenistan. He served UNICEF as its Representative and head of mission in several countries. These include Acting Regional Director, UNICEF Regional Office for South Asia, Interim Representative of Afghanistan, Yemen and Montenegro, and Acting Representative in FYR Macedonia. Dr. Waheed joined UNICEF in 1992 as Chief of Education for UNICEF in Tanzania. In 2002, he was appointed Special Representative in Afghanistan where he advised the Government of President Hamid Karzai and assisted in the coordination and rehabilitation of the education sector on behalf of the United Nations Assistance Mission for Afghanistan. In 2005, Dr. Waheed was appointed Associate Director of UN Development Group Office in New York where he was responsible for simplification and harmonization of the United Nations operational activities. In this capacity he served as Secretary of the UNDG Management Group, exercised oversight responsibilities for the setting up of the first UN Joint Office pilot and led the headquarters support to the UN Resident Coordinator system for Europe and the Middle East. Prior to jointing UNICEF, Dr. Waheed was a Member of Parliament for Male’ and served as Secretary of Education. While in government he served in the Office of the President and as member of Atolls Development Advisory Board, the Maldives Youth Council and the Council for Dhivehi Language and Literature. He had also worked as lecturer at Michigan State University and as a Programme Manager of HSQ Technology Incorporated USA, an information technology firm in San Francisco. Between 1991 and 1992, he worked with UNDP and UNESCO in Swaziland, Lesotho, Mozambique, Bangladesh, Fiji, and Western Samoa. Dr. Waheed received his PhD from Stanford University, USA, in 1987 specializing in the field of international development. He received MA in political science and MA in education from the same university. He completed his undergraduate studies at the American University of Beirut in 1976. Dr. Waheed is married to Ilham Hussain and has three children. Their eldest daughter Widhadh (32) is an architect and owns an IT firm in California, second daughter Fidha (28) is a PhD student in East West psychology at the California Institute of Integral Studies, and son Salim Waheed (22) is a final year student of political science at Stanford University.